THE ABILITY TO REGROW YOUR HAIR IS INSIDE YOU! The Jacksonville Hair Restoration Center is proud to offer the latest innovation in hair restoration. Progrowth Hair Therapy using Platelet Rich Plasma (PRP) treatment and ACell therapy in Florida is an exciting biologically-based proprietary treatment developed from the field of Regenerative Medicine. Non-surgical hair restoration harnesses the power of the platelet to stimulate the regrowth of natural, thick, healthy hair where thinning has occurred. Introducing the Progrowth Hair Therapy System. Not all PRP was created equal! It is estimated that approximately 56 million Americans are affected by hair loss, and up to 40% are women! The Jacksonville Hair Restoration Center helps to treat all patients with medical treatment (Rogaine, Propecia), surgical treatment (surgical hair restoration), and now, biological treatment. 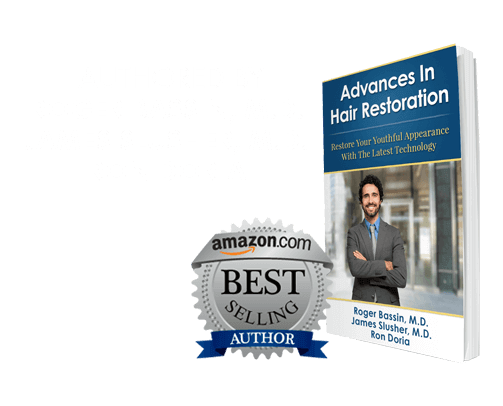 Dr. Bassin has spent years consulting with the top experts in the field and through clinical analysis has developed the Progrowth Hair Therapy system, a proprietary PRP system that uses the combination of ACell treatment and Dr. Bassin’s unique PRP therapy. Videos** Patients individual results may vary. How can Progrowth Hair Therapy in Jacksonville help regrow hair? Platelets were originally thought only to function in forming a blood clot when you get cut. New discoveries in basic science and clinical research have demonstrated that platelets actually orchestrate the body’s repair machinery. Research has also shown that platelets are rich in several growth factors (such as Platelet Derived-Growth Factor, Vascular Endothelial Growth Factor, Transforming Growth Factor-Beta), which are necessary in tissue healing and cellular regeneration. Once injury has occurred, platelets migrate to sites of tissue disruption, initiating a healing process by releasing growth factors and cytokines that stimulate healing. It is believed that cells within the hair follicle become activated and multiply in the presence of these cell signals. PRP therapy in Jacksonville can save hair in the process of being lost and restore it back to its natural, healthy state. How does Progrowth Hair Therapy in Florida work? Is PRP Progrowth Hair Therapy Similar To Stem Cell Hair Restoration? Both PRP Progrowth Hair Therapy and stem cell hair restoration are non-surgical hair transplantation techniques that can encourage the growth of your natural hair follicles. While Progrowth Hair Therapy utilizes your body’s platelet rich plasma and ACell extracellular matrix to regrow hair, stem cell hair restoration uses ADSC’s (adipose derived stem cells) to regenerate hair follicles. These stem cells are harvested from your fat cells and then injected into the scalp. Once injected, your stem cells interact with existing hair follicles and can stimulate hair growth to fill in thinning areas. What are the advantages of non-surgical hair replacement? PRP Progrowth Hair Therapy, available for men and women, helps your natural hair follicles begin to regrow thick, healthy hair. PRP is a safe, healthy, and effective way to stimulate your natural hair to grow again. Is Progrowth Hair Therapy safe? Yes! Since PRP treatment utilizes your own blood that is not modified or altered, there are no issues with rejection from your immune system. It has been used for over 2 decades in skin, wound, dental, and orthopedic-injury healing applications. PRP for hair loss also holds a highly-regarded patient approval rating on RealSelf.com. Published medical literature from all over the world confirms the safety of non-surgical hair replacement, with studies showing medical evidence of the power of PRP therapy. You can click on the links below to view these studies. The American Academy of Dermatology estimates that hair thinning and hair loss affects 30 million American women. This is known as FPHL (female pattern hair loss) and has a distinct appearance, with hair thinning at the top and crown of the scalp, usually beginning with a widening through the central hair part. Also known as androgenic alopecia (the same issue that causes male pattern hair loss), female hair loss comes from a relative increase in testosterone. As women age and lose estrogen and progesterone, the relative concentration of testosterone in their system thus increases (because women make testosterone, as well). This increased testosterone causes facial hair growth but also causes testosterone-sensitive hair follicles to begin to miniaturize, producing shorter, thinner, and more brittle hairs that eventually become depleted. PRP Progrowth Hair Therapy reverses this process and allows these thinning hair follicles to return to their natural state. How do I get started with Progrowth Hair Therapy in Jacksonville? The doctors and staff at Jacksonville Hair Restoration Center would be happy to help you set up a private consultation to discuss PRP Progrowth Hair Therapy. Schedule an appointment online or call our Florida location @ 904.996.0030.